For our honeymoon, just over eight years ago, JL and I went to Walt Disney World. 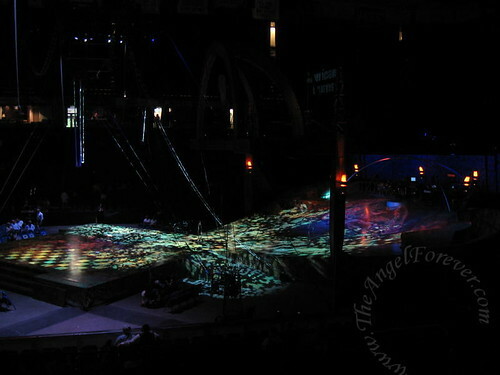 When we were making our plans, one of the must sees was the fairly new Cirque du Soleil in Downtown Disney. La Nouba tickets were quite difficult to get, but we snagged some great seats. As soon as you walked into the specially designed theater you were transformed into another world. The show was like no other either of us had seen before. The performers were amazing and put on the show with such gusto. We immediately became fans of Cirque from that moment on. When we went to Las Vegas in December 2002, we met my Aunt L, Uncle J and Cousin M there. We all agreed that we wanted to see "O" at the Belagio. This show is the one that takes place around a specially built theater with a pool in it. Tickets for this show were and still are extremely difficult to get. I managed to get some for one of the nights we were there. It was fantastic and well worth the price of the show. On Christmas Eve, we had no plans and went to the box office at our resort to see if there were any tickets. We literally walked up right after someone canceled on two seats for Mystere. We quickly bought them and saw our third Cirque performance. Mystere did not disappoint and became my favorite of the Vegas trip. I loved the clowns in the show and the humor involved. Of course, the seats were wonderful in the specially built theater. It has been many years since we have had the chance to see another Cirque du Soleil. Right after JSL was born something came to our area, but was not a real Cirque du Soleil. It was more about the music and dance of the show. We opted not to go and see that. Yesterday, my father called and said he had tickets to see the show here. Surprise! Of course, since my parents were going we had no babysitter. 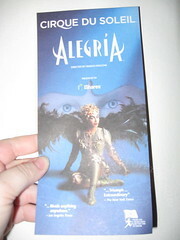 My wonderful husband agreed to be a sweetheart and watch the boys, so I was able to go and see Alegria this evening.Oh my! From the moment we walked in and saw the stage, I knew it would be wonderful. There is just something about the costumes, music, lighting, clowns, performers that combine to make a truly unique masterpiece. The director Fanco Dragone and his troop continue to amaze me each and everytime. Have you ever been to see a Cirque du Soleil show? If you have, what did you see? If you have not would you like to go one day? Now I will be off to dream of magical places in far off lands and more Cirque du Soleil performances in my future with hubby next time. No I haven’t and we could have and everything. When we went to Disney for our honeymoon the package came with tickets as an option but we choose to do something else – I have no idea what. :( Now I totally wish I had seen it. .-= Upstatemomof3´s last blog ..Can A Police Officer Be Mistaken? =-. I’ve never been to any of their shows. I would love to see the water one (eau).. I think they have it in Vegas, but I’m not sure. .-= Drahdrah´s last blog ..Aloha Friday =-. I have never been to a Cirque show. Maybe next time we get to Las Vegas we’ll have to hit it! .-= Swoozie´s last blog ..Aloha Friday! =-. I’ve never gone, but it looks like it would be so much fun! I’m just glad I’m not the one up in the air doing the show. .-= Mika´s last blog ..Aloha Friday #4 =-. No, I never have. I really don’t know anything about it. No but you make it sound magical & maybe I’ll have to see if we can’t get tickets when we go to Vegas next year. .-= Sues2u2´s last blog ..Aloha Friday – 4 Sept =-. We saw a Cirque show once while on our honeymoon at WDW. It was amazing! .-= kailani´s last blog ..Bakugan Roll Across America =-. I haven’t seen it but I would like to! .-= Pamela M. Kramer @A Renaissance Woman´s last blog ..Freebie Friday – Week 23 =-. We’ve never seen them but have seen other shows like them at the theme parks here in Florida. .-= Vicki´s last blog ..Aloha Friday =-. Saw Mystere many years ago in Vegas and loved it. 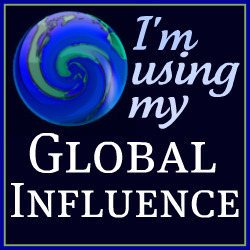 .-= Nina´s last blog ..SAVING ENERGY =-. I haven’t been to Cirque du Soleil show, but I would like to. .-= Ave @ Made In Canarias´s last blog ..Aloha Friday #8 =-. Never been, but I’ve seen a lot of promos and it looks AWESOME! I’d totally go. .-= sheila´s last blog ..A gem of a post. Spongeworthy, in fact.aloha friday too =-. yes, at Busch Gardens, it was okay. We went to Vegas and thought about seeing them there, but no one wanted to. So i guess we did think to highly of it. .-= AuntieE´s last blog ..Aloha Friday – Wedding anniversaries =-. Oh i haven’t have the chance yet.. such a shame , right? No I have never been. I cannot imagine having the money to go see them anytime in my future. :( Happy Friday! .-= Jennifer´s last blog ..Era? Aloha Friday =-. I have never been, but funny that this is your question. Just last night on the news I saw a new show was opening in To…awesome! .-= pam´s last blog ..Aloha! =-. I have never been. Those that have gone have really raved about it, so given the opportunity, yes I probably would. .-= Audrey´s last blog ..Aloha Friday #16 =-. I have never been, but I wish I could go to one. We went to Disney on our honeymoon too but we tried to save $$ as much as possible. .-= shelly´s last blog ..Aloha Friday: Dating Your Husband =-. No I haven’t but I sure would love too. 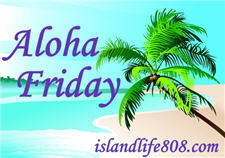 .-= Stacie´s last blog ..Aloha Friday =-. We have not but I would love to see one. It always seems as if something else pops up when we go to Disney and we have yet to make it over to Vegas. Hopefully in the next few years we’ll take a long weekend trip. .-= Catherine @ The Blonde Diaries´s last blog ..Aloha Friday – September 4, 2009 =-. I’ve never been to one either but can’t wait to watch one! 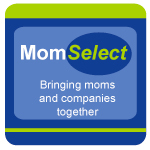 .-= SageMom´s last blog ..AF: Hawaii =-. I have never been but I hear it is wonderful. .-= Stefany´s last blog ..Friday Fragments and Friday’s Freewrite =-. I have never seen the show, but it is coming to town and I have been debating about seeing it. I only have one friend and she would not be interested, and my hubby hates artistic stuff. Thanks for your comment. I had all those toys too. If you liked Care Bears, did you watch the cartoon on Saturdays? Aloha and take care. Yes, I saw “O” over a decade ago when I was in Vegas. It was awesome!! I would love to go to another one! .-= Tara´s last blog ..Aloha Friday =-.